Who washes the dishes as they go when preparing meals??? Who lets them pile up and washes them all after the meal??? Or does it depend on your mood??? I always wash as I go so and so I only have to deal with the dishes we use for dinner. I have a dishwasher but I normally do them by hand as I cook – it’s nice having a sink of clean water to also wipe as I go. I often wash the dinner dishes by hand, too. I usually do them as I go along if it is a complex meal leaving the dishes we eat off of to soak until morning but the pans are done. If it is an easy dinner I just soak them till morning. When I do the dishes in the morning I leave them in the strainer till before dinner then put them away so the strainer is empty for the morning when I do the dishes. This seems to work well for me as I work. I’ve found that washing dishes as I go is a big stress reliever for myself. It saves me so much time! I much prefer to keep my mind cooking and let the dishes pile up for one final SWOOP of the kitchen to clean as the “roast is in the oven”. (Hahaha! like I ever have enough $ to serve roast!) anyway, my husband is just the opposite. He cleans while he cooks. Drives me crazy. He is constantly cleaning after me and makes me nuts! Cant complain though, he is doing my work, after all! Wow to the three of you who already left responses. I totally let mine pile up while I cook. I love to cook, but it’s kind of a tornado. 🙂 I do rinse and I have ever loaded things into the dishwasher as I was going, but it’s not a habit. Nothing related to neatness comes naturally to me. I have finally gotten myself into the habit of doing all the dishes every night and ending with a clean sink and counters. 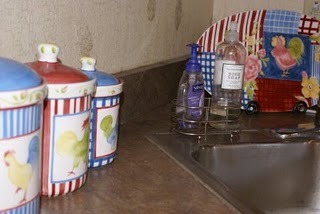 I try not to use a lot of dishes, so there usually aren’t dishes to wash, as I go. They all get washed at the same time. ALWAYS, wash as I go. I can’t stand to see dishes in the sink. 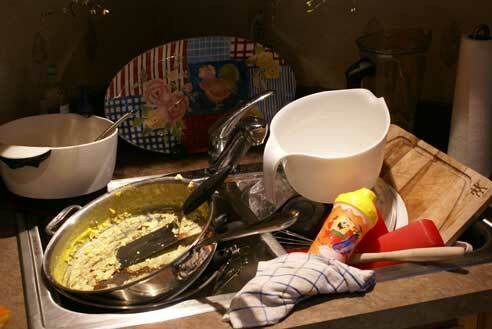 I’ve been known to go to family/friends homes and start doing dishes left in their sinks!! My “CDO” (OCD for people with OCD! 😉 can’t have anything out of place.